The first microbrewery in Wolfeboro, NH. 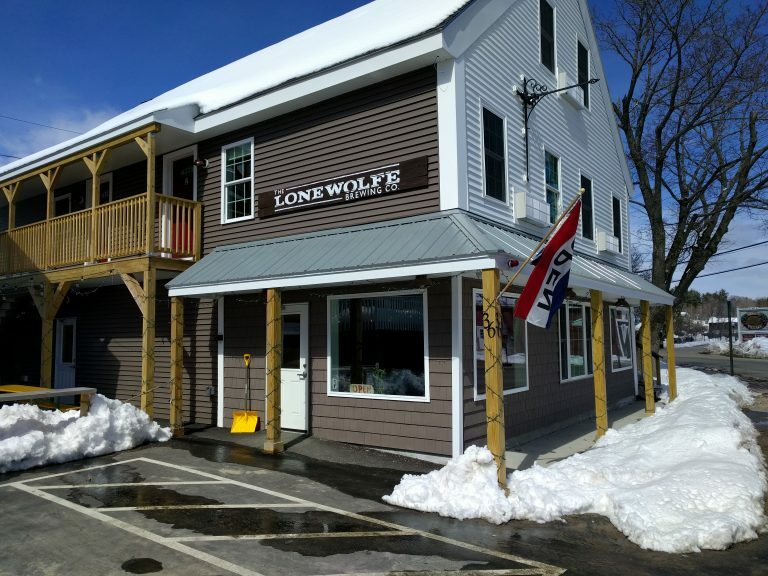 The Lone Wolfe Brewing Company is now on it’s second storefront - this time, a bigger, more tavern-y brewpub that is a couple hundred feet away from the prior location across the street (the Wolfeboro Marketplace). Actually, it was unfair of me to call this space a storefront. Apologies. When did Lone Wolfe Brewing open? Four years ago in 2014. Graham and Jen Combes operate this fine establishment, just a few hundred feet from the main drag in Wolfeboro. In fact, you can see the back bay from the windows. They brew 10 barrels back on their farm (not open for tours), so you know their production is serious. They really have come a long way from a one-man, one-barrel operation. They brewpub is kid friendly, but following trends, there is not a baby changing station in the bathroom. What types of beer does Lone Wolfe Brewing brew? I am not sure if they have a “flagship” beer, per se. But having gotten a flight, I can say that they are all good choices. I didn’t ask about growlers, but I did take home a 4 pack. Be warned, their beers are both worth it and pricey. I’m not sure if we were paying a “Wolfeboro Luxury Tax”, but the flights weren’t cheap. Sidenote: If you are looking for affordably priced craft beer, try White Mountain Brewing over in Ashland. But don’t be scared off as well. “Pricey” is for NH, not NYC pricey. The beer is worth it, trust us. Also, as they don’t brew on site, you won’t catch a glimpse of any kettles or tanks (like Tilton’s Kettlehead). 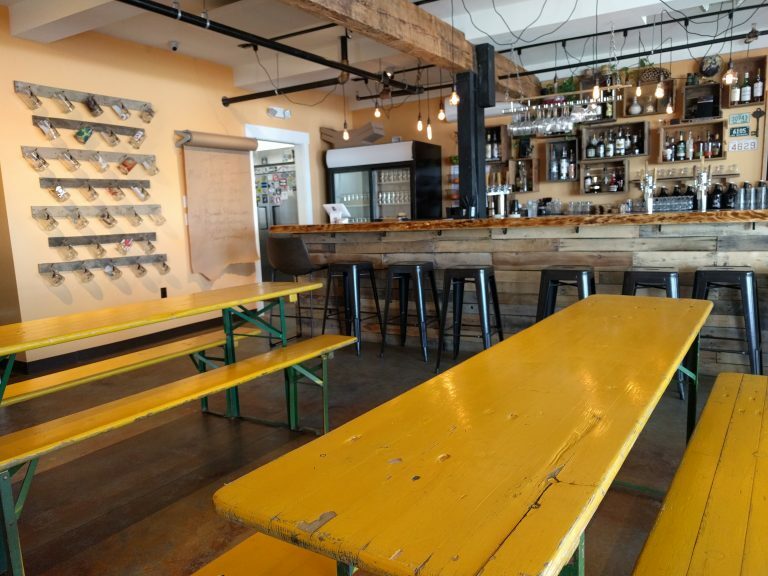 It’s got more of a restaurant/bar feel, albeit one with a very heavy “brewery” feel. Do they serve other types of alcohol? Yes. They are in possession of an assortment of victuals. Definitely bought a flight glass to put on display in the lake house cabinet. Yes. Though not a full service restaurant like Hobbs Tavern in West Ossipee, they serve a decent sized menu’s worth of food. The chicken tacos and the sped zapf salad were pretty good. I remember seeing that Ryan Montbleau played there. That’s definitely more than “guy down the street with a takamine”. They have a pinball machine over to the side of the tavern and an acoustic guitar laying around. Unsure about trivia or anything else. Can I buy Lone Wolfe beers around the Lakes Region? Yes. However, you may need to check in with them as to where. They set their specials on a giant roll of paper. Kinda fun. Gosh, felt like a super donkey then. One other thing about Lone Wolfe and Burnt Timber is that you could totally run a pub crawl between the two of them. Downtown Wolfeboro even has enough bars to rock a 12 Bars of Christmas.